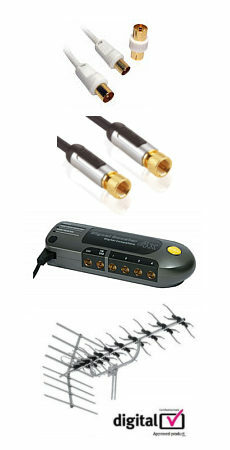 The two main connectors used on analogue audio cables are jack plugs and phono plugs. The most common size of jack plug cable is 3.5mm and is often used on mobile phones, PCs, tablets and portable audio devices. Mobile phones such as the iPhone use a 4 pole 3.5mm cable which supports stereo audio and microphone. 6.35mm Jack Cables are used on larger headphones, professional audio equipment or as Guitar Leads. The phono connector, often referred to as an RCA connector, is a larger audio connector, with analogue audio they are used in pairs, one for each audio channel. Stereo Phono Cables have two phono connectors each end, Phono Extension Cables can be used to extend existing cables and 3.5mm to Phono Cables can be used to convert between phono and 3.5mm equipment. Subwoofer Cables use a single phono connector each end for connecting the LFE output on an amplifier to a sub. There are two types of Digital Audio Cables, coaxial and optical. Optical cables are normally referred to as TOSLink Cables, these carry multichannel digital audio over a single fibre optic cable. There is a smaller version of the TOSLink connector called a Mini TOSLink which is sometimes found on portable audio equipment. Coaxial Digital Audio Cables also carry multichannel audio over a single cable, they have a single phono connector each end. It is possible to convert between optical and coaxial digital audio using a small electronic converter, it is also possible to convert optical to phono, coaxial to phono and vice versa using converters. Although HDMI has become one of the main cables for carrying video there are still a wide range of analogue video cables. Scart Leads are still common, they come in two main cable types, flat cable and round cable, flat cable scart leads tend to be more flexible, both types carry audio and video except RGB only cables which only carry video. Component Video Cables transfer video only, they use 3 phono connectors colour coded RGB and often marked YUV or YPbPr. S-Video Cables again only transfer video and feature a 4 pin mini din connector each end. Composite Video Cables feature a single phono connector each and transfer video only. It is possible to extend audio and video signals over cheap CAT5 or CAT6 ethernet cable using an extender. The Audio Video Over CAT5 Extenders come in pairs and are available for most video signals, analogue and digital. Professional audio equipment often uses XLR Cables for transferring balanced audio, the most common types are XLR to XLR and XLR to 6.35mm Cables.